So reads the anchor of Lindsay Pichaske’s thesis, and it’s a good anchor to keep in mind when viewing her latest offerings that were on display last month at Duane Reed Gallery in St. Louis. Like so many contemporary artists, the natural world has provided Pichaske with a recognizable and romantic template. 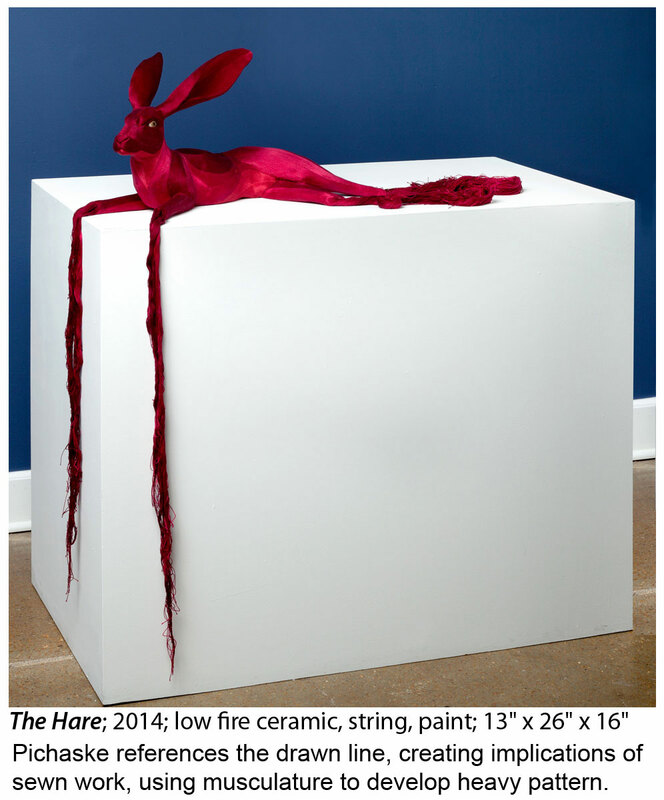 However, as this former NCECA Emerging Artist continues to evolve in her practice, it becomes increasingly clear—the form of gorilla, or hare, or antelope is just that: a form. Not to say it is without importance, because like subject/predicate agreement in a sentence, one inherently needs the other. The viewer who chooses to step back may observe, in the current arc of Pichaske’s practice, that form is a device for her to push against. Form has never fully delivered the essential experience she aims to capture. Rather surface becomes the telling predicate. Her handling of materials to skin form is what leaves the mind of an audience itching. Every material choice is a variation on her query of reality. 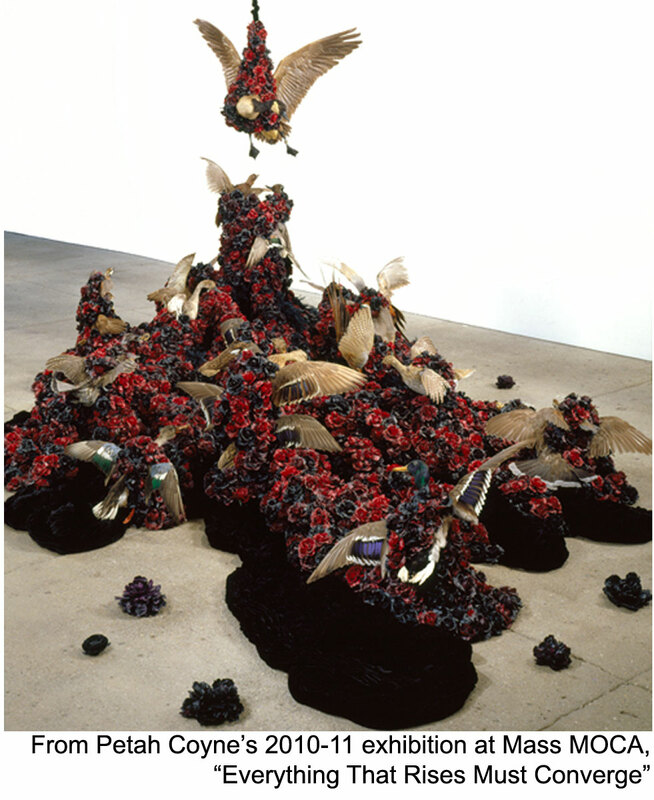 An indulgence I can never refuse when contemplating Pichaske’s work is to compare her use of materials to the work of Petah Coyne. There is a similar melancholy resonating from both artists. There is a comparable darkness. 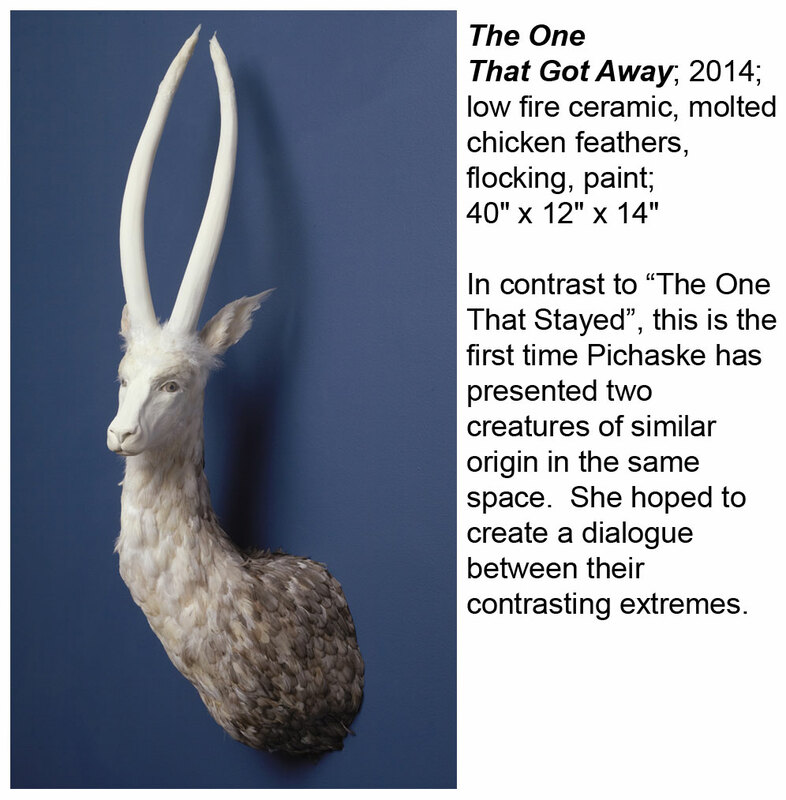 One viewer described Pichaske’s work as a cross between, “…roadkill and the Velveteen Rabbit,” while a review of Coyne by Sebastian Smee acknowledged an overwhelming and admirable fearlessness of visual and conceptual information. Even as my mind and experience desire a connection between the two artists, I have to acknowledge Pichaske’s exploitation of materials is not as aggressive or diverse as Coyne, at least not yet. Coyne rushes at her audience, engulfing them in a hedonist hallucination, piling materials upon form, nearly swallowing them whole; only barely restraining herself within a tonal range. Pichaske’s parameters are tighter. She keeps all parts of a composition recognizable. Form and surface material alike are distinguishable, even as they work to lure the viewer toward a sense of otherness. Comparing the two leaves me wondering about the continued evolution of Pichaske’s work. Will the celebration of material and the growing mastery ever push through to aggressive exploitation of materials common in art objects from decades past? If it does, what will be lost and what will be gained? I have to admit I waffle between embracing Pichaske’s subtle restraint and desiring more. However, it is the subtle veil she draws between the viewer and the natural world making the intangible disconnect between the two tangible. In the 2012 paper, “The Presence of Animals in Contemporary Art as a Sign of Cultural Change” by Karin Andersen and Luca Bochicchio, they examine the distance between the comesticated human condition and the condition of the wild. It’s a slightly dense text, and my 13-word synopsis is certainly an oversimplification, but the paper did reinforce Pichaske’s ability to focus our attention, tapping into our sympathies by deliberately choosing animal forms as her vehicle. As a culture collectively longing for the ferocity and wisdom of the animal kingdom, we readily jump in to anthropomorphic stories. We have from the moment we began to step away from the wild ourselves. She distances us even more from the natural world by using fantastical surfaces from materials that could only be made or are more easily harvested with modern technology: monofilament, synthetic threads, flocking, multiple feathers, sequins, silk flower petals. She has made a conscious choice to abandon the crucial connectivity of realism in the eyes of her creatures, another wall to push the viewer farther away, affirming we are on the other side of the window. But, are we looking out or looking in? Are we abandoned by or have we been abandoned? Right now, such questions don’t seem to be fully premeditated by Pichaske. Rather she establishes a framework where the questions are the by-product of an interested interpretation. We continue to witness the evolution of a maker. The arc of her studio practice is far behind that of Coyne, so maybe it’s an unfair or inappropriate comparison. Nevertheless, it is fun to imagine where Pichaske’s arc will wind up in the future. She is stretching out and she is ever more confident in her ability to exploit materials, to draw in space, to contrast modern made-ness against the intrinsic memory of the natural world. With this exhibition at Duane Reed she is focusing on formal elements and honing her skills of subtlety, attempting to capture the quiddity between tangible and intangible extremes. 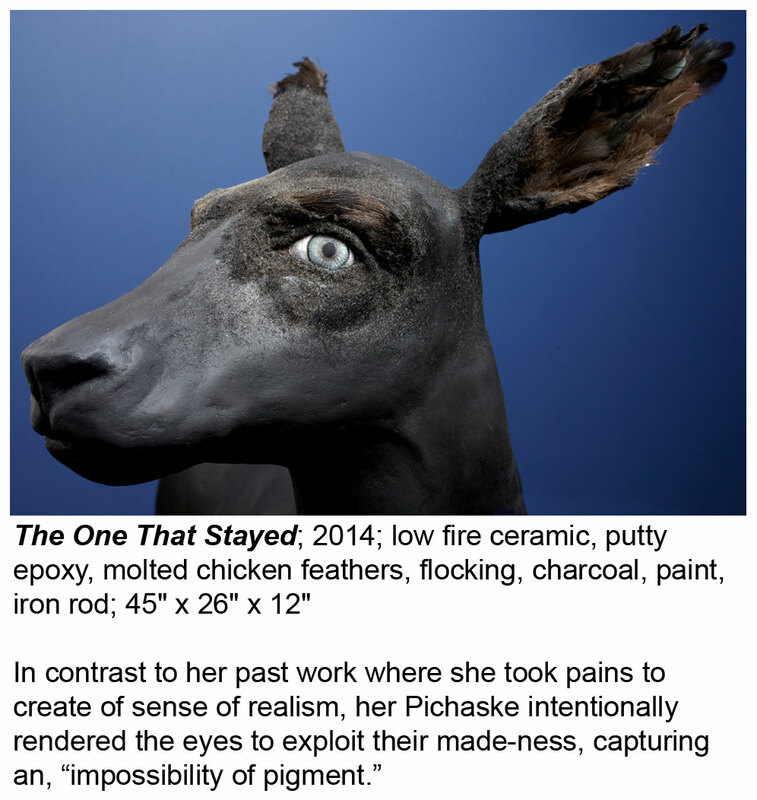 Keep an eye out for Pichaske’s work at Art Basel Miami Beach and SOFA Chicago where she will be represented by Duane Reed Gallery; “A Clay Bestiary” at the Hunterdon Art Museum, (September 21, 2014-January 11, 2015); and “Beast” at the Blue Spiral Gallery, (October 2 – December 31, 2014).